Subscribe to get full access to this operation and the extensive Bone & Soft Tissue Tumour Surgery Atlas. Learn the Proximal Femoral Endoprosthetic replacement (Stanmore METS system, Stryker) for primary bone sarcoma surgical technique with step by step instructions on OrthOracle. Our e-learning platform contains high resolution images and a certified CME of the Proximal Femoral Endoprosthetic replacement (Stanmore METS system, Stryker) for primary bone sarcoma surgical procedure. Chondrosarcoma (CS) is the second most common primary bone tumour and the most common in adults. These range from low to high grade malignant cartilage tumours which may metastasise to the lungs. They are relatively insensitive to chemo- or radiotherapy meaning that surgery is the principal intervention. Five year survival ranges from 99% for low grade to 24% for dedifferentiated chondrosarcomas. 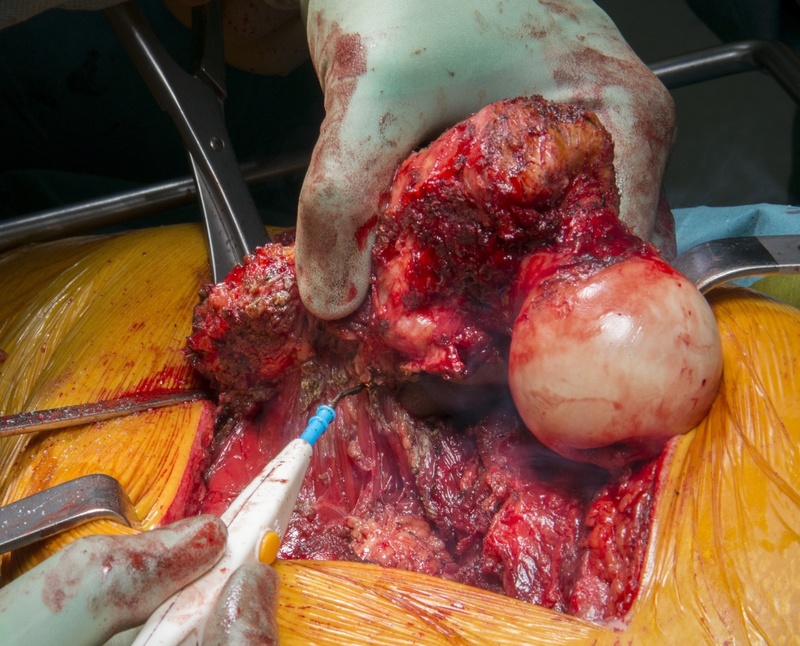 Resection of a tumour from the proximal femur requires reconstruction of the large bone and soft-tissue defect. Achieving adequate surgical margins to ensure the tumour is excised-bloc is the guiding oncological principle to avoid local recurrence. Endoprosthetic replacements of the proximal femur are one of the most common limb-salvage procedures undertaken to reconstruct massive bone defects secondary to tumour, trauma or infection. The complications of such surgery from a systematic review include dislocation (5.8%), infection (5.2%), local recurrence (4.7%) and peri-prosthetic fracture (0.6%). These are both reliable and durable implants that offer immediate mobility and return to function; however in the long-term complications and failure mean that ten year endoprosthesis survival without revision surgery is approximately 75%. Institution: The Royal Orthopaedic Hospital ,Birmingham ,UK.